There is a little seafood restaurant in the West Village that I've been to about a half-dozen times, each time ordering the exact same meal. The restaurant is called Fish, and the meal consists of raw oysters, an ecstatically good appetizer called "Angels on Horseback" (oysters, wrapped in bacon, broiled to a crisp, then served topped with horseradish and cocktail sauce), and a giant lobster cobb salad for my main. We also usually go through a couple bottles of the same vinho verde--a light, slightly-green hued Portuguese wine. For dessert, I admit to sometimes getting a second order of the aforementioned Angels on Horseback. Fish is a lovely little place, but it's in the West Village and I live in Harlem so the commute isn't ideal. The other day, during a quiet afternoon at home, I started craving the perfect melding of lobster-avocado-bacon and decided it was definitely time to recreate a version of it at home. Instead of lobster, I decided to experiment with significantly more affordable rock shrimp. Rock shrimp are small, sweet shrimp with a texture that's nearly identical to that of a spiny lobster. They're usually sold already peeled and deveined (since peeling them by hand can be tricky; the shell really is hard as a "rock"), and cook quickly for a lobster-like meal in just a couple minutes. I chose peppery baby arugula for my salad and topped it with rows of crisp and crumbled bacon, tiny round grape tomatoes, diced avocados, and the rock shrimp--which I seasoned with lemon juice and sauteed in bacon fat. I would have added a hard-boiled egg, but I got impatient and decided to skip it. I confess that I completely forgot about the container of crumbled Gorgonzola hidden behind the milk. 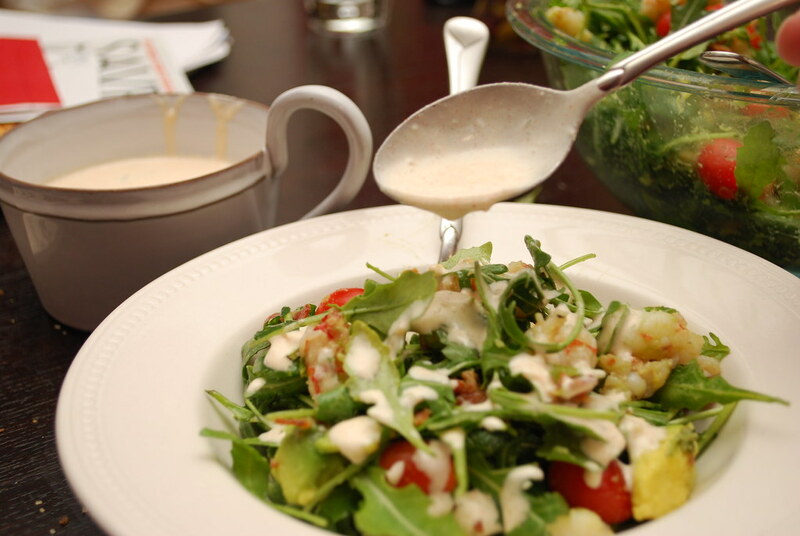 Relying on my taste memory, I whisked together a creamy coconut milk dressing with a few spoonfuls of mayo (for flavor! ), Dijon mustard, lemon juice, smoked paprika, cayenne, my homemade garlic-onion powder, and just a dollop of honey to round everything out. The result was lovely and light with just a hint of smokiness from the paprika. Like most salads, this one is easy to play around with. Use regular shrimp, bay scallops, or spring for that lobster. Add cucumbers or use a mix of greens (a handful of my favorite Upland Cress would be amazing here!). I didn't miss the egg, but I think the cheese would give it something lovely. Even the dressing is flexible (although I think I'll probably keep my version as is). Serves 2, generously. Can be doubled as necessary. Prepare the dressing: Whisk together all the dressing ingredients until fully combined. Taste for seasoning, adding salt and pepper as necessary. Set aside. Fry bacon over medium heat in a heavy-bottom skillet until crisp throughout. Remove from the pan and let cool slightly before crumbling. Set aside, reserving the bacon fat. Raise the heat to medium high and add the rock shrimp to the hot bacon fat. Saute for 1-2 minutes, until the shrimp are fully cooked and opaque. Add in the lemon juice and toss well to coat. Remove from the heat and let cool. Assemble the salad: Fill a large bowl with the arugula. 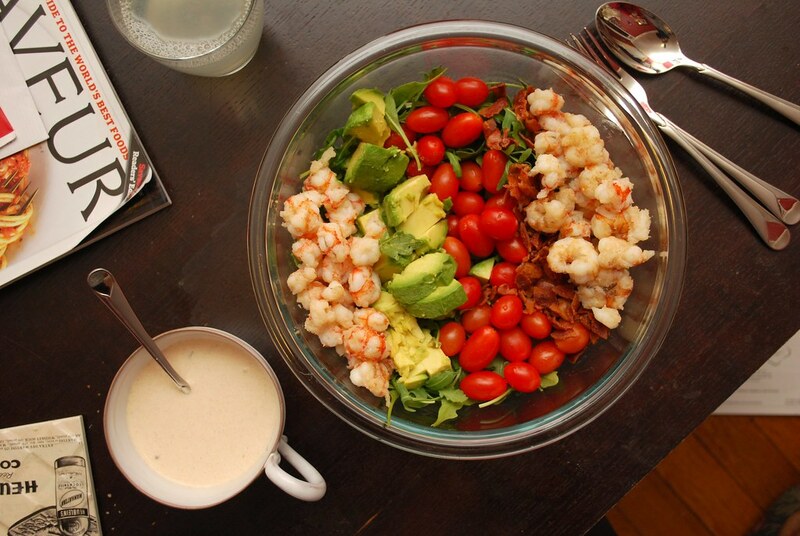 Arrange the shrimp, avocado, tomatoes, crumbled bacon, and Gorgonzola (if using) in single rows above the arugula. Serve with the dressing on the side. Just before eating, toss the salad with a 1/4 cup of the dressing, reserving the rest on the side for guests to serve themselves. one day i want to be like you where i can just taste something (like the dressing), go home, and, relying on only my memory, make it. This looks so delicious! I would eat shrimp everyday if I could. But, in the last few years I have become severely allergic to it and can't eat it. It's like missing an old friend. 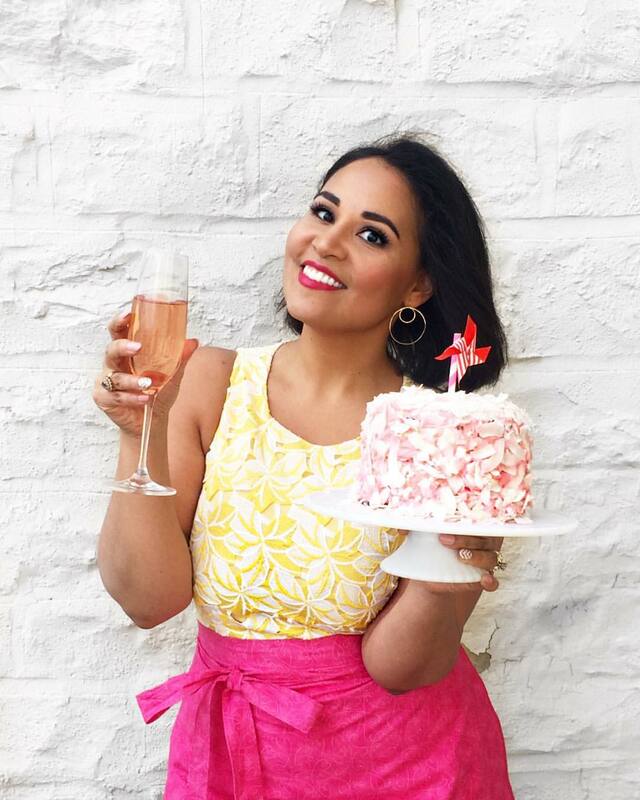 It however does not stop me from admiring delicious recipes! This salad looks so delicious. And I like your creative twist of using shrimp, as opposed to chicken or turkey, like one would find in a traditional Cobb salad. It looks really delicious...I even loved the decoration :)..thanks for sharing. 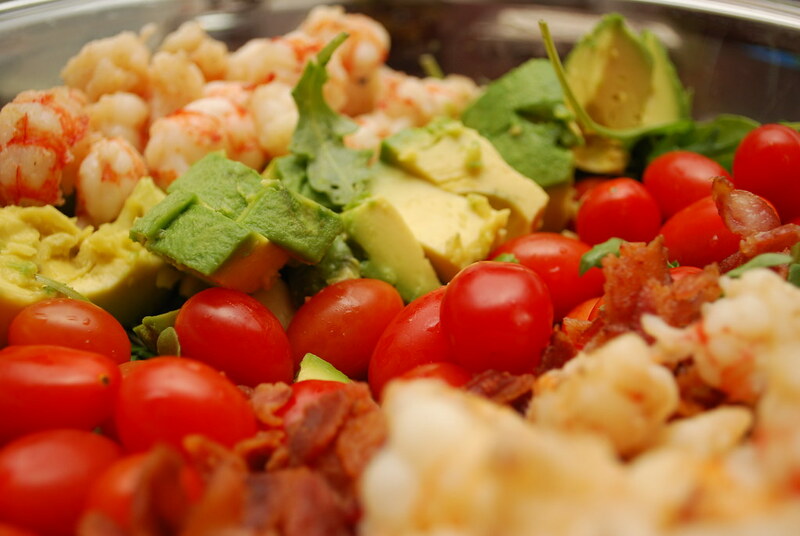 This Cobb salad looks magnificent! I also adore the idea of homemade dressing. Nice work on recreating the dish at home. Drooling over this salad...and the description of raw oysters, Angels on Horseback, and Lobster Cobb Salad. These are all right up my alley. I want to go to Fish! I adore rock shrimp...there's this place we go on the East Coast of FL (wish I could remember the name, I'd give them props) that does them really well. This looks great, and of course healty, My family loves seafood so I will have to make this soon. Please pass the lemon. Homemade garlic onion powder?! Care to share that recipe? This looks really really good. I'll have to make it one day. I'm glad to say that because of your post I did venture out to the West Village and made it to "Fish". Hope to make it back and enjoy another dish.